A while ago I looked at some Japanese pullsaws courtesy of Niwaki, who import and sell direct here in the UK. This time I decided to try two sharpening-related products: a Shapton 2000 mesh ceramic stone with holder and some camellia oil. Niwaki supply Japanese Shapton Glass Series stones in 320, 500, 2,000, 4,000, 8,000 and 16,000 mesh grades. I generally finish up with a 1,200 mesh diamond plate so the 2,000 mesh medium grade sent to me by the owner of Niwaki, Jake Hobson, was slightly unfamiliar territory as I manage perfectly well to get a good edge without resorting to such a fine stone. Ceramic is a different kind of material as denoted by its name of course. 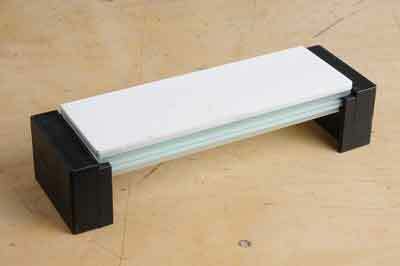 Each grade is bonded to a glass plate and mine came with a special holder, which will accept all the different grades. It too has a bonded glass base but its only function is to elevate the stone and give a perfectly flat reliable base to work on. Ceramic can be damaged, so it needs to be cared for - definitely worth looking after. I thought I would tickle up the tired edge of the carbon steel blade from my ancient Stanley 41/2in smoother using water with a touch of washing-up liquid as a lubricant. With just a few strokes, the blade that had last been working on punishing MDF edges became lethally sharp as evidenced by me touching the edge very lightly - you know that feeling when you cut yourself shaving? Well, it was just short of that - the nerves under my rather tough epidermis - outer skin - sensed it was wickedly sharp. I didn't risk any further contact but fitted it back in the plane to produce some nice fine shavings. Maybe there is something to this superfine edge business after all? It would be interesting to explore finer grades still, to see what effect they have on the degree of sharpness. Of course, if you are still using an old clogged up oilstone, then this won't interest you, but perhaps it should? 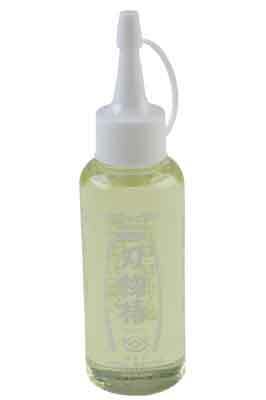 Speaking of which, Niwaki supply camellia oil, which is a thin, light natural japonica oil with paraffin added to it. After using water when sharpening, this oil is perfect for rust prevention and giving a sheen to the metal - wiping towards the blade edge of course. 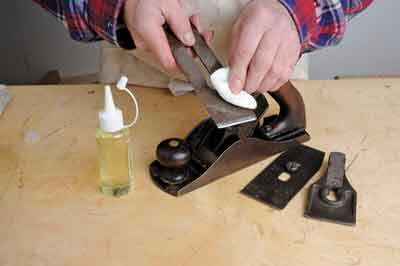 It is also good for giving a sheen to the whole of the plane, to saws, chisels, measuring tools, etc. It isn't heavy and smelly like standard lubricating oils and is a pleasure to use. No doubt good for the skin, too!